Hervé Grandeau, chairman of the Federation of the Fine Wines of Bordeaux, has estimated that prices could rise by 10-20% in 2017 as a result of the April frosts. 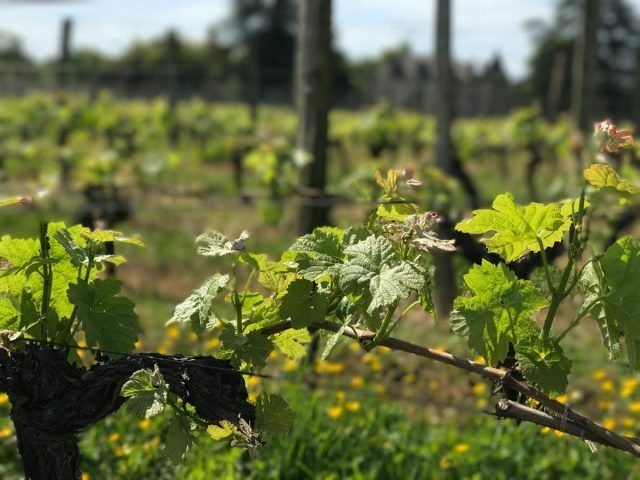 As reported by The Times, this year Bordeaux’s production may fall to around 300 million litres of wine, compared to the annual average of 540 million litres. An estimated 60% of vineyards have been affected, to a greater or lesser degree, amounting to around 65,000 hectares. Experts have predicted that the cold snap has caused damage to the tune of between €1.5 – €2 billion. But is this a fair picture and does it reflect what will happen in other regions that have suffered frost damage? Gavin Quinney of Château Baudac situated in the Entre-Deux-Mers has published a report on Bordeaux’s frost damage for Jancisrobinson.com and Liv-ex, based on his own observations and figures released by Chambre d’Agriculture de la Gironde. He makes the following three conclusions. The first is that the Right Bank faired much worse than the Left Bank, with the large region of Cotes de Bordeaux and sites around Pomerol and Saint Emilion suffering over 80% crop damage. In contrast, St-Estephe, Pauillac and St Julien on the Left Bank, according to Quinney, appear to have experienced minimal damage. On the other hand, Moulis and Listrac in the Médoc were hit appallingly badly, as were the communes of Arsac, Soussans and Cantenac in Margaux and parts of Sauternes and Pessac/Graves. Secondly, even in communes that suffered considerable losses, it was still very variable as to how badly vineyards were damaged. Using his own château as an example, Quinney stressed the importance of site situation and aspect. 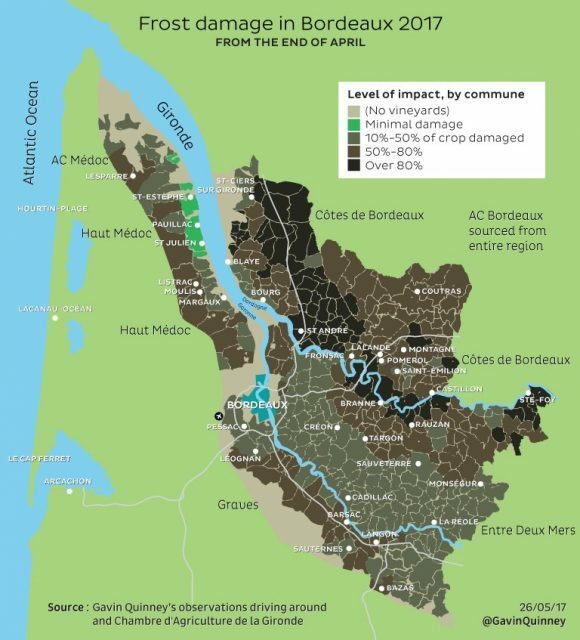 Gavin Quinney’s map of the frost damage in Bordeaux. The worst affected parts in black are clearly spread across the Right Bank. He remarked that losses in some of these areas was 100%. Is, therefore, Grandeau’s (chairman of the federation that represents the likes of Château Haut-Brion, Lafite Rothschild and Latour) 10-20% price hike estimate a fair reflection of the damage caused at the region’s top châteaux? Finally, grape variety is an important factor to consider. At Château Baudac, when the frost struck, the earlier budding Merlot was ahead of both Cabernet Sauvignon and Sauvignon Blanc and therefore, came off the worst. Will this justify a price hike? It is important to remember that the 2014, 2015 and 2016 harvests in Bordeaux were above average volume. The 2016, in particular, was the largest harvest since 2006, producing 577.2 million litres, according to official figures. Will the success of previous years cover the losses of 2017? Speaking to the drinks business earlier this month, the president of the Bordeaux Wine Council, Allan Sichel, said that although there would be price hikes it was important that the they were in proportion to losses. He recalled the devastating frosts of 1991 (and to an extent the bad weather in 2007), which was followed by huge price increases, “we lost a lot of markets [after that], especially for white wines. It is to be hoped that producers still have stock from the 2014-16 stretch to see them through a lean 2017 – certainly a lot of the top châteaux have been holding back greater amounts of stock each en primeur campaign for some time now. English vineyards were also subjected to sub zero temperatures and a severe air frost, however, this followed four record harvests and the pledge that this year, the UK will plant a further one million vines. Once again, some vineyards, for example Denbies (75% crop damage) and Nyetimber’s Hampshire vineyard (90% crop damage) experienced high losses, whereas others, such as Greyfriars Vineyard with an estimated loss of under 30%, came out relatively unscathed. Carlos Delage, export area manager of Cune, said that Rioja was in a similar position. Despite suffering up to 50% frost damage to its vines, Delage states that producers remained optimistic about the effect of the cold snap. CEO of Vega Sicilia, Pablo Alvarez, however, told dbHK that: “I feel like the prices for the grapes are going to increase. For us, we don’t need to buy in, but obviously the grapes [prices] are going to be more expensive”. It remains to be seen to what extent the higher prices will be passed on to the consumer. Somehow it just would not be France if the moment they have a frost they did not talk about jacking up the prices before waiting to see the quantity or the quality of the 2017. I am just amazed that with so much choice around in the world today that either they can get away with it or the customer will accept it. Charles, you are not wrong, and Allan Sichel’s comments concur. Bordeaux (and Rioja etc) are selling into a global market where every wine faces direct or indirect competition. The more elastic the demand the more likely that buyers will seek alternatives if prices rise significantly. In 1991 hard-hit Bordeaux white wine producers who had lost half of their crop asked for 50% price increases. The outcome? Outside of the local market drinkers simply switched to other sources of Sauvignon Blanc etc. An unintended gift to NZ, Chile producers etc.